On Tuesday, SpaceX launched a Falcon 9 rocket into orbit from the Vandenberg Air Force Base in California. While the launch went well, one camera capturing the action had less success. 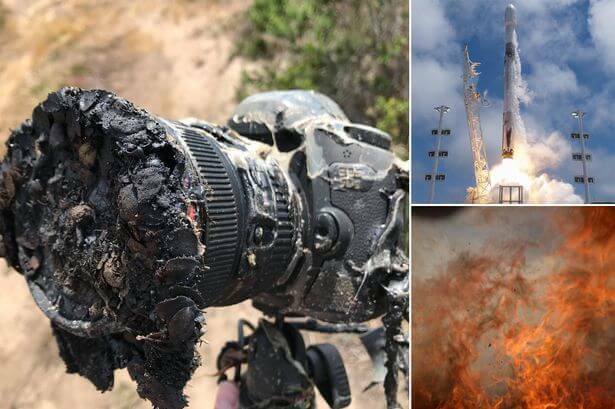 Despite being over 400 metres away from the action, the camera, which belonged to NASA photographer Bill Ingalls, melted in a fire sparked by the launch. Mr Ingalls posted photos of the melted fire on his Facebook page, and explained that while the camera melted, the photos remarkably survived. He wrote: “Well, one remote cam outside the pad perimeter was found to be a bit toast(y). And yes – it made pix until it’s demise. One of the final photos captured by the camera before it melted shows the raging brush fire in detail, with ferocious flames engulfing it. The camera appears to be a Canon DSLR with a large lens on it – which together we predict would cost around £5,000. Thankfully, Mr Ingalls had four other remote cameras set up during the launch, which survived unscathed. The incident marks the first time that one of Mr Ingalls’ cameras has melted during a launch, despite the fact that he has been snapping pictures since 1989. NASA conference: Will NASA announce alien life discovery on Mars TODAY?